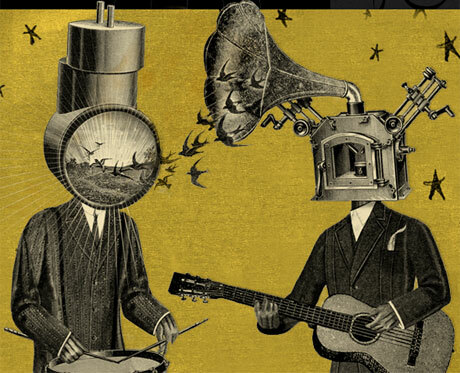 As Jeff Mangum took the stage at the Olympia a few weeks ago, a once distant dream of ever seeing Neutral Milk Hotel in a live setting quickly became a fully-fledged reality. Hiding behind both a well-worn hat and a majestic mane, Mangum delivered the first chords of Two-Headed Boy to an eager audience. Without hesitation, a crowd which remained fairly still for opening act Elf Power, erupted with energy, dancing and squeezing every lyric out of their lungs. In the dying moments of the opening song, the rest of the band joined Mangum on stage in a rowdy rendition of The Fool, a track which truly embodies the raw talent of their infamous 1998 release In The Aeroplane Over The Sea. As the night went on, the communal energy of the audience grew in intensity, often overpowering Mangum’s vocals. This, however, was to the concern of the band as horn player Scott Spillane stopped the concert mid-way to ask a group of over-enthusiastic audience members to be more considerate of the people around them. While most of the setlist consisted of songs from their 1998 release, the band played a handful of tracks from On Avery Island, Beauty and their 2011 EP (recorded 1992-1995)—Ferris Wheel on Fire. At several points in the night, bassist Jullan Koster whole-heartedly thanked the crowd for their undying support, in place of Mangum who shied away from addressing the audience entirely. After a 15 song set, the band momentarily hid behind the stage before coming back for a four song encore which included Ghost, [Untitled], Two-Headed Boy (Part Two), and Engine. Overall, the show was an incredible experience— though I must admit, there were definitely brief moments where the band fell out of sync or seemed to be a little rusty. However, to have the opportunity to see a band that has been in hiding for nearly a decade was absolutely unforgettable. Though I may never have the chance to see Neutral Milk Hotel again, I can undoubtedly say that the memory of the show will stick with me for a very long time. This entry was posted in Reviews on January 31, 2014 by admin.